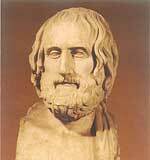 One of the most important Greek dramatists, Euripides (c.480-406BC) was born in Salamis on the day of the great battle between the Greeks and the Persians (Sept. 23). He got a thorough education, and his first play entered the Athenian drama festivals in 454BC, without success though. Twelve years later he won the first prize, and was to win a total of five prizes in his life. Euripides saw himself as a misunderstood writer and was often criticised by people like Aristophanes (The Frogs). He kept to himself and did not involve himself with politics. Influenced by the Sophists and Protagoras, Anaxagoras and Socrates, Eurupides wrote about the Greek legends and myths in an everyday language and without traditional religious and moral values. Euripides wanted to make his characters as people really were, not what they should be. He was also interested in the individual, rather than the gods and heroes. Many of his protagonists were female characters. He was very famous in his time, but not exceedingly popular. The writer ended his days at the court of the Macedonian king Archelaos, where he accidentally was killed by the kings hunting dogs. 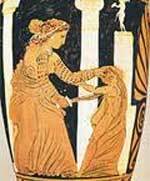 Euripides perhaps best known work is Medea, but his plays Orestes, Bacchae, Trojan Women and Electra are also famous. Other works were Cyclops, Alcestis, Hippolytus, Helen, Iphigenia at Aulis, Andromache, Children of Heracles, Hecuba, Suppliants, Madness of Heracles, Iphigenia in Tauri , Ion and Phoenissae. Euripides used the deus ex machina in his works, the sudden and unexpected intervention of a god which would change the story. He used the chorus less and had them dressed in more realistic costumes. MENELAOS: It is your duty to obey, my lady. You must accept the husband who stands before you, and forget the one whose claim has ended. In your present position this will be the best for you. And if I come home safely to Hellas, I will put an end to evil tales about you; only be the wife you should be to your husband." During the long life of Euripides, who commenced writing tragedies at the age of eighteen, he witnessed Athens emerge from a cluster of villages, defended merely by a wooden rampart, and almost crushed for a time by the Persian invasion, to the days of Cymon and Pericles, when a new city arose, beautified with the works of artists more talented than those of any other age, and when taste and intellect attained their highest development, until, as he grew older, the luxury and failing energy of the rising generation were slowly but surely undermining her political igour, her reputation, and her very existence. The listeners to his compositions were of all ranks and ages, representing, besides the various Hellenic races, foreigners from all the neighbouring countries with whom they were in friendly communication, and whose idlers and traders were sojourning in the fair capital, the eye of Greece. The fates have decreed the death of Admetus, king of Pherm in Thessaly, but Apollo has prevailed on them to accept a substitute. His father and mother decline, but his wife Alcestis is willing to ransom him with her life. The play opens with her doom at hand, and Death is waiting at the palace gate for his victim. She takes leave of her husband, children, and household, amidst tears and wailings, and, just after her decease, Hercules arrives as a guest. Observing the signs of grief in the house, he would pass on to another acquaintance, but Admetus will not hear of such a breach of hospitality, and orders a servant to prepare dinner for him. The slave in attendance is scandalised at his appetite and conviviality at such a time. Hercules rates him for his solemn- visage,- reminding him that for all to die is natures due ; but, when he learns that his host is mourning for his wife, he is sobered at once, and hurries out to render such service as the strongest of mankind can perform. Alcestis having been laid in her grave, Death is making ready to feast on her corpse, little expecting who is about to intervene. Her noble, and tender, and loving nature is finely told by the poet, and a Chorus of old men express the grief of all who knew her that she is removed from the cheery sunlight, the lucid streams, and the verdant pastures, which gladdened her when alive. The character of Admetus, on the other hand, is weak and selfish, he would not die instead of her, but now he will forego all further enjoyment in life, and evinces neither spirit nor heroism. He even reproaches his old father for not having consented to take the place of Alcestis, and is deservedly rebuked for his want of real affection for his wife in not submitting himself to the summons of the fates. The appearance of Hercules, however, has cast a ray of hope on the general gloom, for he was believed to be as generous and genial as he was valiant and strong. A Choral song comments on -the relentless power of necessity, and, alluding to Alcestis, they tell the king that nothing can restore her to life, but that her tomb must be honoured, and the passing traveller told, "Within doth lie She who dared for love to die". Then comes the final scene, in which Hercules has compelled Death to release his prey, and restores the devoted wife to-the-arms of her astonished husband. Jason, has deserted his wife Medea for the daughter of Creon, King of Corinth, who cannot rest until the Colchian witch is out of his dominions. An old nurse tells a servant of Jason of Medeas sad condition, and her apprehension for the two children, whom she begs may not be brought near their sorrow-frenzied mother, for she fears her wrath will not abate until it has swooped upon some prey. Medeas voice is heard within, exclaiming, Cursed sons of a loathed mother, die, ye and your sire and let all our house wane away. The Chorus of Corinthian women comment on her wild and whirling words; and again is heard the plaint of the indignant princess. The Chorus sympathise, and Medea comes forth, expatiating on the hardship of being a woman, and the few prizes and many blanks in the lottery of marriage. She entreats them to keep her counsel if she should reveal her secret purpose, which they promise to do, admitting her right to avenge herself on her husband, Creon now enters and bids her not linger to quit his realm with her two sons. Speaking aside, she says "My enemies crowd on all sail, and there is now no haven from despair" but she kneels to the king, and obtains his consent to delay her departure till the morrow. Then she confides to the Chorus her intention that the father and the girl and he my husband shall perish by dagger or drug, vowing that none shall wring her heart and still be glad. After an intervening Chorus, Jason enters and assures her that he has done his best to avert her banishment, and offers a handsome provision for herself and children. Medea turns upon him with a recapitulation of the services she has rendered him and scornfully rejects his pretended sympathy. Still he calls the gods to witness his desire to serve her, but she tells him to go to his new bride, and warns him that he will wish the new wedding undone. The Chorus celebrate the power, and deprecate the wrath of Venus and Aegeus, King of Athens, opportunely appears to offer shelter and protection to the injured heroine, whose plans of vengeance are now altered. She recalls Jason, regrets her angry words, and will even conciliate his new wife, and the king, with a robe and crown, on condition that her children shall not quit the realm. Jason assents, but the gifts are poisoned, and Glauce and Creon expire in torments. The boys have perished by their mothers hand, Open these gates and see thy murdered sons. He does so, and would kiss their dear lips, but Medea taunts him with her wrongs, and mocks his love for the offspring he had consented to banish. Agamemnon is awaiting in his tent at Aulis the arrival of his wife, Clytemnestra, and their daughter, Iphigenia. It is night, and the occupants of the camp are asleep, not the sound of birds is heard, nor of the sea, the winds are hushed in silence. The king of men is agitated with grief, for Diana detains the Greek fleet on its way to Troy with contrary winds, because he has shot one of her sacred deer, and Calchas, the soothsayer, has declared that he must sacrifice his daughter to appease the goddess. He has accordingly sent for her and her mother, on the pretext of marrying her to Achilles, but has afterwards written a letter enjoining them to remain at home, which Menelaus has intercepted, and an angry debate ensues between them. Agamemnon remains on the stage, and, receiving tidings that his wife, with Iphigenia and the infant Orestes, have arrived, he- tells his woes to the audience. At daybreak the camp is astir, and the brothers are reconciled, Menelaus retracting his unkind words, and declaring that neither love nor ambition shall divide them. The queen and her children then appear in their chariot, and are welcomed by a Chorus of women, whom Clytemnestra addresses. Agamemnon receives them with simulated joy and suppressed fear, whilst their happiness and curiosity respecting the approaching nuptials, and their innocent ignorance of the genealogy of the supposed bridegroom, are masterly creations of poetic fancy. Agamemnon vainly tries to persuade his wife to return to Argos, leaving him to conduct the marriage ceremony, and, at his wits end, goes to consult Calchas. During his absence, Achilles arrives to report that he can no longer restrain the impatience of the Myrmidons to reach Troy, and is astonished at being saluted by Clytemnestra as her son-in-law. Highly indignant on learning from an old slave the plot, he promises to do all in his power to rescue the victim. Agamemnon returns to find that his secret is divulged, and is implored, first by his wife, and then by his daughter, to change his purpose. But he assures them that he cannot recede; and presently Achilles rushes in, with the intelligence that the soldiers insist on the sacrifice. Iphigenia now heroically volunteers to die, in order that the Greeks may triumph in their expedition, and that her father may gain un ending renown. All admit the necessity, and a solemn procession is formed, the Chorus chanting a funeral hymn as they proceed to the altar of Diana. The goddess, however, appears to the weeping mother, to tell her that her daughter is not dead, but has been spirited away to the Taurus Chersonese. She has been a priestess of Diana, in her temple at Balaclava, for twenty years, without news of her country or kindred, when a Greek vessel arrives at the barbarous region, and two strangers secretly survey the temple, with the object of carrying off the image of the goddess to Attica. They are Orestes and his friend Pylades and Iphigenia relates that she dreamt of her brother the previous night. A herdsman arrives with intelligence of the capture of two youths on the beach, who will be a grateful offering on Dianas shrine, and bidding the priestess make ready for the sacrifice. On learning from them all that has happened since she left Argos, she decides to spare one of them, that he may convey a letter to her father. An exciting contention takes place between the two friends which of them shall do her commission, each claiming the privilege of dying for the other. Then brother and sister recognise each other, and all three plot together to deceive Thoas the king, and make their escape with the statue. A soldier brings intelligence to Thoas that the strangers were bearing it and Iphigenia away in their boat, but that the sea swept the galley back to the beach. The king instantly summonses his people to avenge the insult, and the capture of the fugitives is imminent, when Minerva appears, and apprises Thoas it is her pleasure that both Iphigenia and the statue shall be carried to Greece, for the establishment of Dianas worship there, and so Agamemnons children are saved, and the faithful Pylades is to marry their sister, Electra. Cadmus, a prehistoric king of Thebes, was grandfather to Bacchus, and the play opens with a crowd of Theban women of all ranks, dressed in skins and ivy, brandishing poles, and dancing, goaded to frenzy by the appearance of a handsome stranger, with a retinue of damsels, who claims kin-ship with the royal house, and who announces himself to the audience as the wine god. The king and his seer, Tiresias, are preparing to join in the general excite. ment, but are restrained by his grandson, Pentheus, to whom he has ceded the sceptre, and who announces his determination to put down this new worship, threatening to imprison the women, and to cut off the strangers head. Cadmus counsels him, for the credit of the family, to acknowledge the new deity, but Pentheus spurns the advice and the enthusiasts depart for the mountains. The Chorus deprecate the blasphemy of Pentheus, and warn him of the- consequences of his impiety. Bacchus is now brought before him manacled, and, although greatly struck with his personal attractions, he consigns him to the royal stables as a prisoner. The god, however, releases himself, and, after appearing to his worshippers, again stands before Pentheus. A messenger brings the news that the revellers are spreading all over the country, and Pentheus decides to go and witness the orgies, with the view of suppressing them without resorting to force. Notwithstanding his recent denunciations, he, in his eagerness to carry out his idea, accents the gods offer to be his guide, and is persuaded to assume the dress of a Bacchanal. Calling to his women that the man is in their net, Bacchus bereaves him of sense and makes him a laughing-stock for all Thebes. The Chorus respond in jubilant strains, anticipating his doom. Pentheus is now seized with madness, and a messenger relates his miserable end. Led by the god to Mount Cithaeron, he falls into the hands of the women, amongst whom he recognises his mother, Agaoi, crying out to her,I am thy child, thine own, my mother ; but she knows him not, and tears out his arms from his shoulder, upon which Ino, his kinswoman, and the rest of the women, entirely dismember him, and carry away his limbs to Thebes as trophies, the returning procession being ushered back to the city by a choral hymn of ghastly triumph at the massacre, his mother bearing his head, which, in her frenzy, she believes is a lions, to suspend in the temple. Bacchus now appears and decrees that Cadmus shall become a dragon, and his wife assume a brutish shape, but that, in after ages, they shall resume their human forms, and be borne by Mars to the Isles of the Blest. 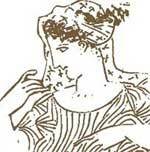 In order to establish a divine pedigree for the Ionic Greeks, whose ancestors had emigrated from Athens, Euripides adopts a legend that Creusa, the daughter of one of her early kings, who was married to Xuthus, a military leader, bore a son to Apollo, whom she named Ion, and concealed in a cave under the Acropolis, from whence he was carried by Mercury to Delphi. Here he was reared by one of the vestals, and dedicated to the service of his fathers temple. Xuthus comes to consult Trophonius, a neighbouring oracle, why his wife has no offspring; and Creusa to obtain, ostensibly for a friend, , tidings of her son. Encountering Ion, she tells him her history, and is rebuked for aspersing the god, the Chorus remarking that mankind seldom realise their wishes. Xuthus enters with the intelligence that Trophonius has referred him to Apollo, but has hinted that they will not return home childless. Ion converses again. with Creusa, and admits having heard of Apollos intrigue. Xuthus now re-appears, with an injunction from the Pythoness to address the first male stranger he meets as his son. Ion is, of course, the stranger, but he recoils from the salutation, and threatens Xuthus with an arrow in his heart. After some discussion, however, they mutually accept the relationship, but Xuthus proposes to conceal the discovery from his wife, who may not care to acknowledge a ready-made son and heir, although she will no doubt take to him in. time. Meanwhile, he will celebrate the event by a sacrifice to Apollo and a feast to the Delphians. As he leaves the stage be begs the Chorus, who are ,Athenian women, not to reveal the secret; but as soon as Creusa returns, attended by an aged servant, they tell her everything, except the name of Ions mother. Jealous and indignant, she confides to the servant her intention to poison the youth with some of the Gorgons blood which she possesses, when lie is beneath her roof, but the servant points out she will certainly be suspected,` a step-dames hate is proverbial. So she entrusts him with the poison to infuse secretly into Ions goblet after supper. In the midst of a choral ode, an attendant enters hastily in quest of Creusa, saying the plot has failed, the old man is arrested and has confessed, and the Delphian authorities are in pursuit of her. The Chorus elicit from the messenger that an ill omen having been uttered as Ion was about to drink, he poured his wine on the ground, and a dove that drank some of it died in convulsions, which led to the discovery. Creusa now returns she has been doomed to death by the Pythian Council, and Ion is to be her executioner. Clasping the altar, she appeals for life, but is told,"Ill becomes it that the unjust and just alike should seek protection there." The old prophetess, however, who tended Ion as an infant, produces the basket and embroidered clothes in which he was found, and Creusa claims them as her work. She embraces her long-lost son, and acknowledges that Apollo is his father. Minerva comes forward and explains the reasons for the concealment, bidding Creusa seat her son on his grandsires throne, with a prediction of the fortunes of the Ionian race, and that she shall be the mother of another son by Xuthus, from whom will descend their rivals the Dorians.